When analyzing forex, nothing is more satisfying than establishing a strong correlation between a particular currency pair and another quantifiable investment vehicle. You see – we fundamental analysts love to kid ourselves that we can actually explain what’s going in the forex markets, but it’s only when you can visually observe (and statistically confirm) a correlation can you actually pretend that this self-assuredness is justified. On that note, I found myself looking at in interesting chart today: the EUR/USD vs. CHF/USD vs. S&P 500 Index. My purpose in drawing this particular chart was to ascertain how risk appetite (represented by the S&P) is being reflected in forex markets. As you can see, two observations can immediately be made. CHF/USD very closely tracks the S&P (or vice versa), while the EUR/USD similarly mirrored the S&P for most of the last 12 months, before suddenly diverging in November 2010. By extension, this raises two questions. First, why should a rising S&P be accompanied by the Swiss Franc? After all, the former is a proxy for risk appetite, while the latter is a symbol of risk aversion. That means that tither the S&P is a weak indicator of risk appetite, or the Swiss France is not being driven by risk aversion. In a way, I think both notions are true. Specifically, US equity prices are are primarily a sign of US economic recovery and strong corporate profits. It’s probably equally accurate to say that the S&P promotes risk appetite, as saying it reflects risk appetite. Moreover, as US stocks and investor risk appetite have increased, interest in the US Dollar has (somewhat ironically) decreased. One would think that this would spur a depreciation in the Swiss Franc, but I guess this was superseded by the falling Dollar. [For that reason, I actually added the MSCI Emerging Markets Stock Index after I started writing this post, because I realized it was a better proxy for global investor risk appetite. Sure enough, the recent continuation in the Franc’s rise has coincided with a correction in emerging market stocks]. While this explains why the Euro should also appreciate for five consecutive months, it doesn’t offer any insight into why the EUR/USD correlation with the S&P should suddenly breakdown. [Question #2]. Recall from my earlier posts that there was a sudden flareup in the Eurozone sovereign debt crisis in November 2010. Around that time, there were a handful of debt downgrades, Ireland received an EU bailout, and there was heightened concern that the crisis would soon spread from Greece to the rest of the PIGS. This caused a bout of intense Euro instability, against both the US Dollar and Swiss Franc. While the S&P continued rising, interest in emerging market stocks began to flag. It’s extremely tempting to posit a connection between these two trends, especially since it would seem to be implied by the chart. However, I think the correction in emerging markets is due more to Central Bank intervention and a recognition that a bubble was forming, than to the EU sovereign debt crisis. 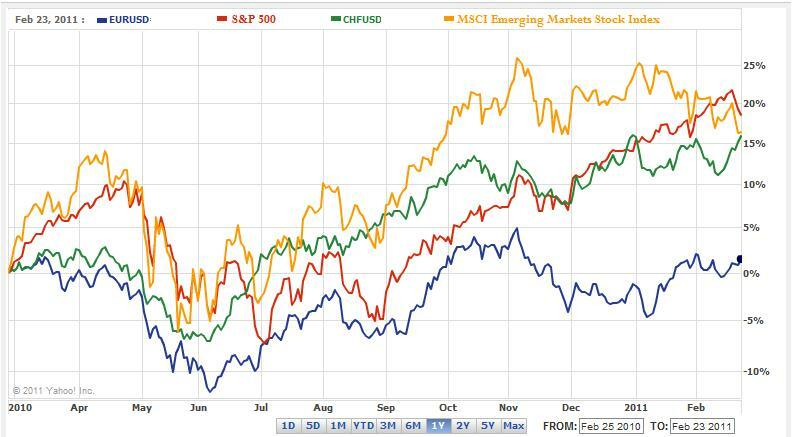 That the Euro has rallied in 2011 even as emerging market stocks have begun to decline, supports this interpretation. Trying to draw meaningful conclusions from these correlations is frustrating at best, and dangerous at worst. Namely, that’s because it’s impossible to completely distinguish cause from effect. The two stock market indexes are probably the least dependent of the four items. For instance, the Euro is derived in part from the Dollar, which is derived in part from the S&P. You could say that the Franc takes its cues from the S&P (as a proxy for risk appetite) and the Euro. Second of all, the strongest correlation on the chart (CHF/USD and S&P) is also the most unexpected. In the end, I think only one solid conclusion can be drawn: uncertainty surrounding the Euro will continue to boost the Franc. While I probably could have told you that without the use of this chart, at the very least, it reinforces the interconnectedness of all financial markets and that even if poorly understood, all trends are ultimately related. These are correlations we watch very closely in our live online forex trading training course and live trade room. We have been noticing the recent pullback of eur/usd from the risk correlation. Thanks for the charts, they really give a good view of these correlations.